Far From The Madding Crowd read by Robert Powell - 'Wessex' and its scenery plays a starring role in this story of innocence lost, breaking free, unrequited love and unchecked desires. Examining the sometimes-detrimental relationships between men and women the story follows Bathsheba Everdene and five other central characters, all of whom, like nature, have their own particular virtues and flaws. The Mayor of Casterbridge read by Martin Shaw - A novel that locates the onset of the Industrial Revolution in an impassioned and competitive relationship between two men. Michael Henchard has ascended in Casterbridge to become a successful businessman and the town mayor. However his deceitful ways alienate many of his allies, and he soon finds himself ousted by newcomer Donald Farfrae, whose political nous and logical thinking give him the upper hand. Tess of the D'Urbervilles read by Martin Shaw and Lindsay Duncan - A complex, profound and heartbreaking novel. At the time Hardy's sensitive depiction of his heroine, an unmarried mother whose relationships with men lead to tragic consequences, was considered by some to be immoral. Yet it has remained a jewel of English literature. 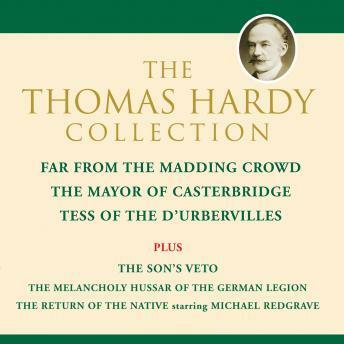 BONUS FEATURES: Two short stories, The Son's Veto read by Joanna David and The Melancholy Hussar of the German Legion read by Martin Jarvis plus a 1948 radio dramatisation of The Return of the Native starring Michael Redgrave.